ENSENADA — The Mexican Navy invited The Log to spend a few hours at the country’s Segundo Región Naval Base in Ensenada to observe its Search and Rescue (SAR) operations; this writer also had a brief meeting with the Port of Ensenada to gain a little insight of how local and federal officials interact with boaters. The Mexican Navy regularly monitors the Baja California coastline for all sorts of boating activities between San Diego and Los Cabos. A naval unit in Ensenada, the first official port American boaters reach when traveling into Mexico from the California coast, is the first line of defense for suspicious activity but is also making an effort to ensure anyone in danger during nautical emergencies is attended to immediately and educate recreational boaters of the proper paperwork needed to navigate south of the border. Mexico’s Navy instituted its Search and Rescue (SAR) unit in 2009. The first unit was launched in Puerto Vallarta; the second unit arrived in Ensenada on Aug. 13, 2009. Lt. Cmdr. Lois Mora Palacios said the aim of each SAR unit is to become as efficient as possible in responding to nautical emergencies. A SAR unit is also operational in Los Cabos; a new unit is planned for San Felipe, which is at the top of the Sea of Cortez. The SAR unit in Ensenada is equipped with three vessels: two high-speed 33 footers and one 47-foot vessel. Palacios said the 47 footer functions similar to a U.S. Coast Guard Cutter. Two rescue dogs are also deployed into the water whenever someone is drowning. Each of the high-speed boats are known as Defender and can tow up to 2.7 tons, travel up to 250 nautical miles and reach a top speed of 50 knots. The larger 47 footer also has a 250-nautical-mile range but can tow up to 150 tons and features a top speed of 25 knots. Palacios added the SAR unit, which is on watch 24 hours per day, has access to all Navy assets, including helicopters and first responder gear. The SAR unit monitors VHF Ch. 16 and digital selective calling (DSC) for possible distress calls. – Nature of the distress. The SAR unit out of Ensenada immediately responds to distress calls by boat between Tijuana and Cabo Colnett, from the shoreline to about 10.5 nautical miles out to sea; the unit can response to any distress calls within a 90-nautical-mile radius by helicopter. Those seriously injured while out at sea can be transported to a nearby hospital by boat or helicopter. Members of Ensenada’s SAR unit shared stories of notable rescues they performed, including one where someone who dived off a 60-meter cliff (almost 200 feet) and into the water. The diver reportedly suffered from serious injuries to his face and a fractured shoulder. The SAR unit was unable to reach him v by boat. He was treated for injuries and safely brought back to shore. 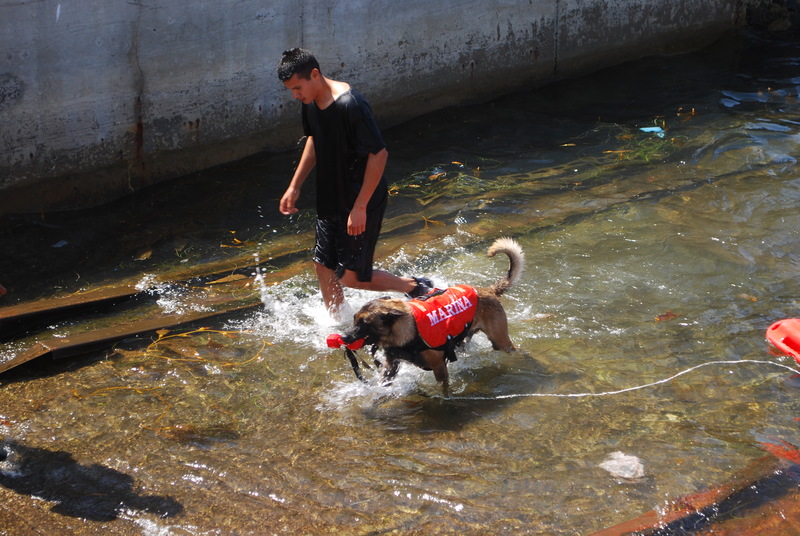 During two demonstrations performed for The Log in the Port of Ensenada, the SAR team showed how dogs are used to save potential drowning victims. One demonstration was performed with a dog deployed from the shoreline; there were two potential victims, with the dog rescuing one and human member of the SAR unit saving the other. A second demonstration featured one of the 33-foot Defenders racing to a potential drowning victim and a dog jumping into the water toward the distressed human. In both cases, a dog carried with him a floatation device, with one side a grip held by the dog’s mouth. The victim holds onto the floatation device on the other end as the dog pulls the distressed human to shore or the SAR vessel. In the second demonstration, one member of the SAR unit joined the dog in the water to check the victim’s vitals and make sure he did not have any broken bones. Palacios said first responders are medically trained to tend to any situation, such as providing CPR, control bleeding and stabilize one’s spine. The SAR unit responded to 57 calls in 2011; 28 of those calls were false alarms. There were 63 distress calls in 2012 (13 false alarms), 38 in 2013 (four false alarms) and 14 through the first few months of 2014 (two false alarms). The unit received 17 distress calls and five false alarms so far this year. 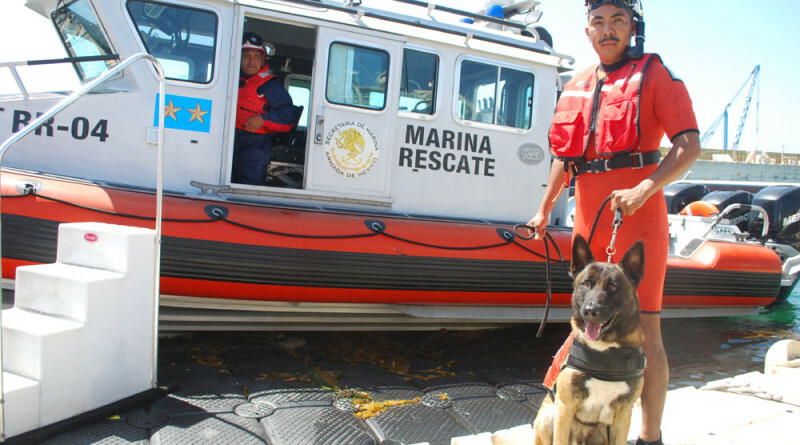 Ensenada’s SAR unit, which communicates with the U.S. Coast Guard, has 29 members, including 12 swimmers, six coxswains and four engineers as well as a team of divers and officers. Boaters can reach the SAR unit in distress situations on radio (VHF Ch. 16 or DSC) or by phone at 066 (the Mexican equivalent of 911) or 011-52-646-172-4000 (if calling from the U.S.). The national government and local consulate recently announced stricter enforcement of immigration policies, meaning any one aboard a boat must have proper documentation on hand. Mexican officials are willing to work with boaters to ensure interactions are as smooth as possible. Consulate General María de los Remedios Gómez Arnau issued a statement in July informing boaters the Mexican government and Navy will increase monitoring and enforcement efforts off the Baja California coast. Ensenada port captain José Luis Ríos Hernández said there was a time when Mexican officials were rather strict with American boaters who navigated south of the border without the proper paperwork. He said nowadays officials are focusing on education, advising anyone with incomplete documentation of what to have filled out the next time they visit Mexican waters. – Online Temporary Vessel Import Permit. Detailed information about each form can be found on pescadeportivaenmexico.sectur.gob.mx/en/. Anglers must inform the Mexican Ministry of Agriculture, Livestock, Rural Development, Fishing and Food Supply of intent to use anything other than fishing tackle when dropping a line into the water and retrieving catches. Mexico’s main concern for ramping up enforcement is national security; however, boaters who are prepared with all the proper documentation should experience a smooth visit south of the border. The Mexican Consulate General’s office is making every effort to keep boaters informed and educated. Visit the consulate’s website at consulmex.sre.gob.mx/sandiego/. (Be sure to translate the page into English). ← How do you want your Aids to Navigation?